I have made the decision to eliminate some items from my capsule wardrobe. After living in my capsule for just over a week, I have decided that certain items in my wardrobe are not working. I included a pair of skinny jeans that "fit", but honestly they are so uncomfortable. None of my button up shirts actually close over my bust and the t-shirts do nothing to hide the remnants of my "baby bump'. 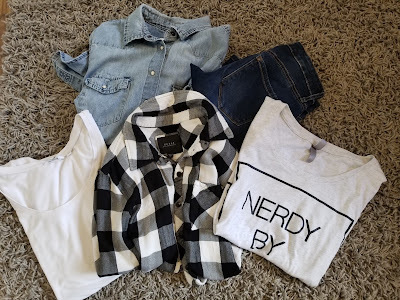 I chose to dive back into capsule wardrobes to minimize the punches to my self-esteem and these items just were not flattering. At all. The beauty of a capsule is that it helps you discover what you love and what you dislike. Right now, a lot of my former loves are not fitting well. That is okay. I will remove them from my capsule and hang them up. I am sure that when I start trimming down more, the items will fit again and hopefully even flatter my figure. The removal of these items take me down to 28 items. I think that I can find plenty of outfits within that number. I don't have any outfit pictures for you this week because I was trying to find a way to make the above items work. My outfits did not fit well so I am going to keep those to myself. Onward and upward!